With the fragmentation of Twitter mobile and desktop apps resulting in a great volume of tweets no longer coming through the Twitter web interface, sussing out @replies can be tricky. For example, if @MarshallK sends three tweets with links within an hour and receives 20 @replies congratulating him on his content curation skills, how does he know which of the three links generated the best responses? As with any other question involving Twitter use and measurement, there’s an app for that. 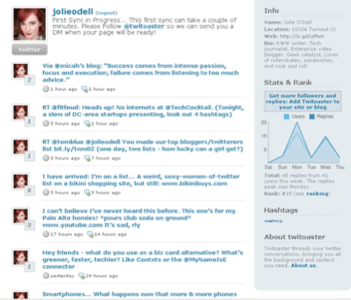 Not only does that app, one Twitoaster, conveniently thread Twitter conversations; it also generates charts and statistics, sorts hashtags and link details, and delivers tweets in excess of 140 characters. As you can see, all the replies to this exact tweet are prettily aggregated together in an uninterrupted stream. Brilliant! 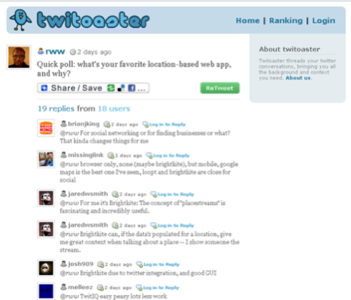 For the particularly insufferable, Twitoaster also provides badges for blogs and other sites so users can boast about their engagement anywhere on the web. If only more detail were provided in the analytics department – for example, as a professional blogger it’d be nice to know whether I’m engaging more users in the middle of the day (when decent people should be sleeping) or in the middle of the night (when I’m actually most likely to be awake and alert). So an hour-by-hour breakdown of replies would be great. 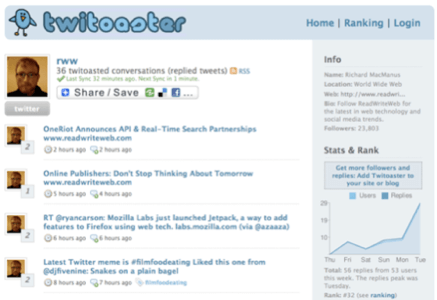 The greater the detail, the more opportunities Twitoaster users will have to optimize their engagement metrics.  You can find ReadWriteWeb on Twitter, as well as the entire RWW Team: Marshall Kirkpatrick, Bernard Lunn, Alex Iskold, Sarah Perez, Frederic Lardinois, Rick Turoczy, Sean Ammirati, Lidija Davis, Jolie Oâ? ?Dell, and Phil Glockner.